Azwraith, the Phantom Lancer, is the quintessential illusion-based agility carry in Dota 2. With his army of illusory clones, he is able to overwhelm the opposition, sowing confusion and discord within their ranks and shredding them to ribbons with his physical attacks. He is also capable of pushing objectives at a blistering speed, also thanks to his army of doppelgangers. His first ability Spirit Lance gives him a handy nuke, which also spawns an illusion right next to the target. The illusion itself lasts a few seconds, and automatically attacks whoever it’s latched on to. Spirit Lance is a great way to box out opponents in lane, thanks to its reasonable mana cost and annoyance factor. His second active ability Doppelganger temporarily removes Phantom Lancer from the game upon activation, then summons two illusions in random points within the target area. This makes it perfect for dodging spells with slow projectiles or otherwise telegraphed animations, and for confusing your enemies as you attempt to escape death. His first passive ability Phantom Rush gives him and his illusions a cheap and easy way of quickly closing the distance to a target. Upon reaching the target, Phantom Lancer and his illusions gain bonus agility, which means more attack speed and attack damage. This is also particularly useful in the lane, especially when it comes to harassing lane opponents. And finally, his ultimate ability Juxtapose gives him and his illusions a chance to create even more illusions when landing physical attacks. As one might imagine, such an ability can get out of control with enough illusions on the field, and is the source of most of Phantom Lancer’s damage in the late game. Combined with things like Diffusal Blade and agility-increasing items, Juxtapose makes Phantom Lancer an oppressive force on the battlefield. But of course, all this power comes with several caveats. As a melee hero, Phantom Lancer really doesn’t like getting harassed in lane. If he is hounded constantly by his lane opponents, he will find it rather difficult to secure both gold and levels in the early game—which spells doom for him in the mid game if not addressed. Being dependent on illusions also makes him weak when he doesn’t have any, and food for heroes that normally feast on illusions such as Sven, Ember Sprit, and Earthshaker. With proper positioning and assistance, though, Phantom Lancer can become very difficult for the enemy team to deal with. They will never know which of his illusions is actually the real hero, which itself can be a huge asset in small-scale engagements and five-on-five teamfights alike. And thanks to Doppelganger, locking him down is an even bigger ask of pretty much any team that doesn’t pack area of effect disables. Choose to run with the phantom army, and you might be able to place your opponents’ heads on your many pikes. Phantom Lancer’s skill progression is simple, though the reasoning for it is something that usually goes over the heads of new players. We’re referring to the build which maxes Phantom Rush first, in order to assist with last hitting in the lane and to provide a way to harass opponents without spending too much mana. At first glance, this seems like a totally counter-intuitive skill build considering the power of Spirit Lance, but the utility of Phantom Rush is actually quite surprising. If it proves to be an annoyance to you in lane, though, remember that you can always toggle Phantom Rush off in order to preserve its cooldown and keep your positioning. We recommend doing this so that you can maintain the optimal range between yourself and the creep wave, which should help in terms of scoring last hits. Once Phantom Rush is maxed out, Doppelganger is next, in order to reduce its cooldown as soon as possible. You will need this in the mid game, in order to dodge abilities and ensure that you always have illusions with you. Take note that Doppelganger can effectively be used to teleport through terrain, so keep this in mind whenever you use it to escape gank attempts. Spirit Lance will be maxed out last, when Phantom Lancer has a bit more in terms of stats. Juxtapose should be taken at every turn, in order to maximize its strength as soon as possible. Just like most other illusion-dependent heroes, additional stats will be king for Phantom Lancer when it comes to itemization—at least after Diffusal Blade is purchased. Diffusal Blade synergizes very well with Juxtapose, Doppelganger, and Spirit Lance, since illusions also possess its mana break mechanic. Within a few seconds of attacking a target, they will likely have no mana left in their tank, which makes them easy prey for you and your teammates. Its active ability also provides you a handy slow, which is always good when you’re a melee hero. Going back to the stat items, though, Manta Style will be the first of these. Yasha alone already gives you a nice boost in DPS and movement speed, but Manta Style kicks it up to eleven by giving you even more illusions to play with. Of course, the Ultimate Orb in there also gives you more health and mana, which is important because your illusions die faster than the real thing. Similarly, Heart of Tarrasque is an excellent choice for Phantom Lancer, due to its ability to bring him back up to full health as long as he hasn’t taken damage in the last five seconds. It also gives you and your illusions a ton of base health, which can be extremely overwhelming and hard to handle for the enemy team if they have no methods of clearing your illusions. Luxury picks for the deep late game include a Butterfly for even more DPS and some passive evasion, Monkey King Bar against heroes like Phantom Assassin, and Basher/Abyssal Blade if you really need the lockdown versus heroes that buy Black King Bar. Phantom Lancer’s rotation in a teamfight isn’t complicated at all, since you’ll be mostly concerned with generating illusions through regular attacks. You generally want to initiate with Spirit Lance first, to slow down a key target such that you get in range to activate Phantom Rush. Start chopping away at the target to get your illusions into the fight, and use Doppelganger to dodge spells if need be. Of course, if there is no threat of getting nuked down anyway, you can opt to use Doppelganger to create more illusions for you to work with. Rinse and repeat until you win the teamfight. Countering Phantom Lancer is a lot like doing the same with Terrorblade: exploiting his low health pool is key. Harass him early and often in the laning phase, preferably with cheap magic damage. Keep him away from the creep wave with things like Venomancer’s Poison Sting, Viper’s Poison Attack, Undying’s Decay, and the like. After all, if he is unable to even go for creep kills, he will not be able to purchase his items—which is always bad for a carry like Phantom Lancer. As mentioned in the introduction to this guide, heroes with cleave mechanics or those that purchase Battle Fury also work well against him. 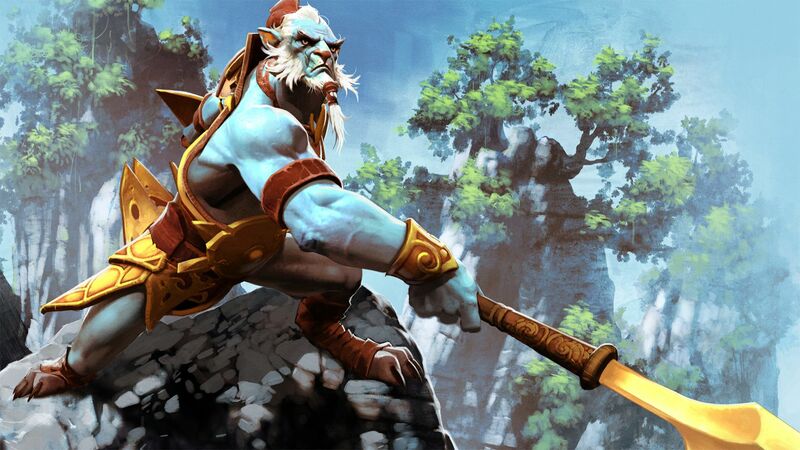 In fact, Phantom Lancer is borderline unplayable against picks like Ember Spirit and Sven, who can clear out his illusions in the blink of an eye with Sleight of Fist and Great Cleave, respectively. Kunkka, Axe, Gyrocopter, and Earthshaker also do well against Phantom Lancer in the same vein.